A little bit of meal prepping can go a really long way when it comes to saving time and energy with meals. It is great whether you work full-time (or more), have kids in multiple activities throughout the week or just want something easy to make so you have more time for your favorite shows. Is anyone else watching Ozark right now? OMG! And, how 'bout them Chiefs! 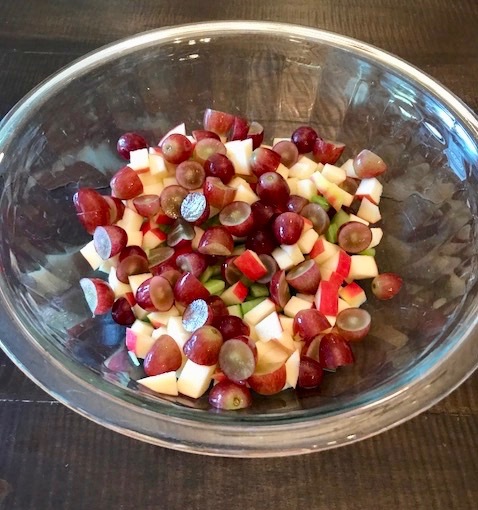 There are a few things I like to have on hand to keep lunch simple or to use for dinner when we are running out the door to soccer practice and baseball games. One of our staples is roasted chicken. I love how versatile it is as far as flavors go and ways to use it. I roast a large pack of boneless chicken breasts at least weekly and use them in some darn delicious meals. Real chefs would tell you to use bone-in chicken for flavor but I don't care to mess with the bone-in breasts myself. If you don't mind it then give it a try! I also like to keep a lot of fresh veggies on hand so I often have most of the ingredients of the recipes I'm giving you today. With the chicken already cooked, meals come together in no time! Wash, pat dry and trim chicken breasts. Place on pan. Drizzle extra virgin olive oil on both sides of each chicken breast. Roast for 20-25 minutes depending on thickness of chicken. Check at 20 minutes for internal temperature of 165 degrees. Cook longer if needed. Store leftovers in refrigerator for 4-7 days (you'll see different amount of time from different sources). Now for the good stuff. Really the options are endless with roasted chicken but here are my current favorites. I absolutely love chicken salad! I could eat it daily and I did recently after we took a big batch to a party and had leftovers. It is also versatile as far as what you can add to it, the type of dressing and how you eat it. The key to it is adding some dried tarragon! Mix all ingredients in small bowl. Add more greek yogurt to liking. Serve as sandwich, with crackers or eat as is. Enjoy! This is currently my favorite salad to make. 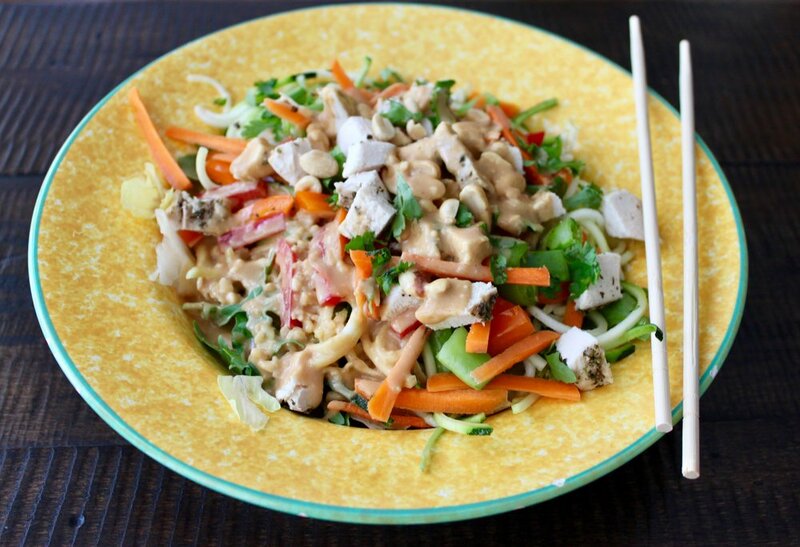 I've been making a few Thai flavored dishes throughout the past year and figured out how to throw my own peanut dressing together without a recipe but I will send you to a great blog with a great recipe. This salad can be just a dump everything from your crisper drawer in it and go or you can use more traditional veggies. spiralized zucchini - I am using the OXO table top spiralizer and I love it! You could add a cooked grain like brown rice or quinoa as well. Toss together all ingredients. Add toppings as desired. Enjoy. This is one of my favorite lunches because it is fast, easy and it fills me up. Just add some fruit on the side. Wash sweet potato and poke holes in skin with knife. Microwave sweet potato 4-5 minutes or longer depending on thickness. Reheat chicken in pan or microwave. Slice cooked sweet potato in half lengthwise. Add a bit of butter or ghee. Top sweet potato with chicken. Add shredded cheese or other toppings as desired. This one is a no brainer because who doesn't love chicken tacos? Perfect for your taco Tuesday instastory, right? I don't need to give you a recipe for this one because we all have our own way with taco night. For the chicken, just throw some cumin and chili powder on it if you didn't add that already. I prefer a taco salad with lots of shredded lettuce, jalapenos, salsa and avocado. Don't forget the cilantro...and a tequila cocktail! I hope this gives you a few more easy weeknight recipes to add to your arsenal. Also, some different ways to use leftover or pre-prepped chicken. Have a great weekend, friends!